In 2007, we worked in the North Loop of Minneapolis on a 100-year-old brick building now known as the SOHO building. The tenant wanted an open concept layout with environmentally friendly materials and exposed infrastructure to fit the former industrial space. During construction, we were respectful of condominium residences above the space with regard to dust and noise control and safety. We used many protocols aligned with LEED such as cork flooring, recycled carpeting and oriented strand board while staying true to the building’s original bones. Natural light combined with unique lighting fixtures, exposed ductwork and beams enhanced the high-ceiling space. 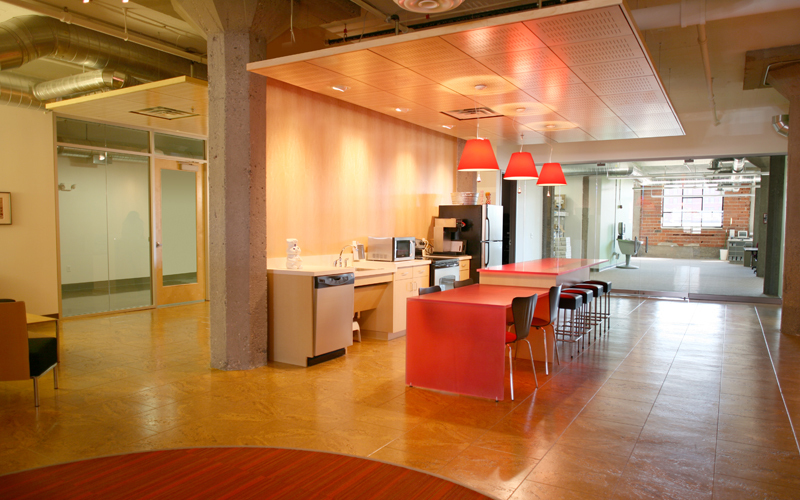 Private offices were structured with glass walls and sliding “barn” doors. The completed office was featured in Development Magazine as an example of green building ideas and we were invited to the successful open house. The agency is still happily creating in this space.